Firstly, we will get rain eventually although, with increasing unpredictability, we must be ready for any rain event. It is important for many reasons to keep on planting and to remember the enormous pleasure felt when our plants grow vigorously or flower for the first time. 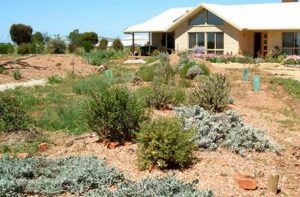 If we cover our plots with as much growth as possible, we are storing carbon by the tonne to offset the use of the family car and some other unavoidable uses of fossil fuels which support the Australian life style. 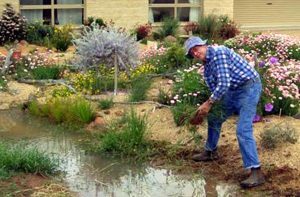 To plant during autumn drought conditions in hard, dry soil in many parts of Victoria involves a deeper appreciation of water-wise gardening principles, including the selection of the appropriate species and the timing of planting. 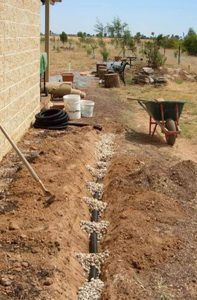 Many people are using the mounding and channelling methods to direct storm water into garden beds. Innovative methods of collecting rain water, from even the smallest roof, means water will be available when it is most needed. It can also be directed to depressions or a dry creek bed situation where the seepage will give surrounding plants a boost following a wet period. This extends to forming a saucer to concentrate moisture for the young windbreak/specimen trees and to facilitate watering without waste. 1. 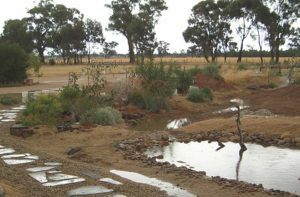 Rainwater-fed water feature overflowing into a dry creek bed © Jan Hall. Soil preparation should be done well ahead. This is especially important for most of us with less than perfect garden soil. If the site is hard and dry, preparation will take time so we are looking at the slow gardening method. When you are digging the site over, the use of clay breaker (or even soil wetter on moisture-repellent soils) with buckets of recycled house water may help loosen up the soil. Remember “no dig” gardening? Layers of quickly broken down organic material such as pea straw are placed over the planting site with blood and bone or old cow, horse or sheep manure. If this is left to weather over the season, the soil becomes more friable. We are adding fibre, storing carbon, thereby increasing its fertility and moisture retention properties. By understanding your soil you can adjust its properties to the needs of particular plants by the addition of gypsum, sand or compost as required for that well-drained ideal. If we are in the usual hurry to get them in now then it is vital to have good compost, Maxicrop®, water-holding crystals and mulch at the ready. Consult this list of hardy plants, this list of drought tolerant plants, and explore the possibilities of old reliable genera such as Acacia, Callistemon, Calothamnus, Dodonaea, Melaleuca and Senna. New, exciting selections appear regularly, and don’t overlook the indigenous range. 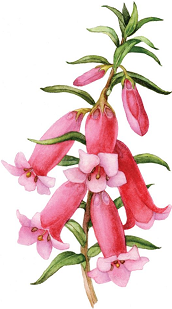 Australia has the world’s widest selection of flora that copes with drought and we are discovering more drought-tolerant species of daisies, Eremophila, Grevillea, Hakea, Westringia etc. Wonderful contrasting effects can be created using silver foliage (evolved to conserve plant moisture) and darker foliage (to reduce glare in hot weather). Aim to plant at the most appropriate time. This is usually when rain is expected. For Victoria that generally means in the cooler months when evaporation and transpiration are at their lowest and less follow-up watering is needed. Plants, if bought in from an outside source, should be hardened up to your conditions at least three weeks before planting – or grow your own. Use seaweed conditioner (For example, Seasol®, Maxicrop®) to precondition plants. Give them a good immersion in a bucket of this solution on the day. Use water-holding crystals as insurance, and water in with the seaweed solution to boost the plant’s vigor. If water is scarce, plant just a few at a time (preferably only when rain is expected) and allow for follow-up waterings when it does rain. A slow watering system can be devised using a soft-drink bottle with the bottom removed. Insert the neck into the soil at root level and fill as needed. Windy conditions cause a high evaporation rate so wind protection is vital. Use plastic or shade cloth tree guards for shelter. Cut tree guards in half for small plants, which will quickly establish even if your garden is exposed to wind. Small rocks or bricks are useful as additional mulch around newly planted seedlings and to hold them in place until new roots form. Use a pervious material which permits any rain to seep through. Gravels or coarse sands are particularly effective over well prepared soil. Finally, be inspired. Plan ahead for a garden full of plants suited to thrive in the prevailing climate. This is an opportunity to learn more about the adaptability and resilience of our flora.